The maps available for download on this page are complements to the trek descriptions in Trekking Peru. It is not safe to trek using a map without the corresponding description. See pages 49-50 of the book for general advice about maps and navigation. For an important note about safety, see page 70 of the book or An ounce of prevention on this site. The alignment of trekking routes on our GPS-uploadable maps is generally very good but not perfect, especially on chapter maps because of their large scale. Maps, instruments, intuition, and trek descriptions are all important elements of navigation. None should be relied on in isolation; rather, they must be brought together and used with common sense. Several different types of maps can be downloaded from this page, including the orientation maps and chapter maps found at the beginning of each trekking chapter and the trekking maps for each trek. Most maps are available in two different formats. PDF maps are for viewing and printing in larger sizes than could fit in the printed book. Note that if you reduce or enlarge a PDF for viewing or printing, then the numerical scale indicated on the map (eg. 1:58,000) will no longer be correct. The scale bar, contour interval, and other map details remain correct regardless of reduction or enlargement. Orux maps are for use on GPS-enabled Android devices running the Oruxmaps app. The app is available free of charge from www.oruxmaps.com. Unzip the file you download below (eg. TrekkingPeru_Trek19_Qeswachaca.zip) and copy the folder you unzipped (TrekkingPeru_Trek19_Qeswachaca) to the "mapfiles" folder of Oruxmaps on your Android device. Detailed instructions are found in the user's manual on the Oruxmaps website. The Peruvian Ministry of Education’s ESCALE website offers good regional orientation maps for free download as PDF files, see escale.minedu.gob.pe/mapas. They include some trails and the precise locations of schools in remote areas, which can be useful landmarks. Two series are available, published in 2009 and 2017, respectively. We used the 2009 series extensively while researching Trekking Peru but have not yet used the 2017 series. We provide direct links to those ESCALE maps, in both series, which are mentioned in each trek description. Passwords are not required for orientation maps, chapter maps, or ESCALE maps. 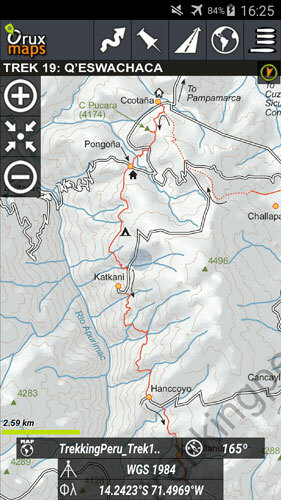 Trekking maps in both PDF and Orux format are password protected. In order to use these maps you will need the printed book. Passwords are the final word on various printed pages of the book, as indicated below for each trek. Enter the password exactly as it appears in print, including any capital letters but without spaces or punctuation. For example, the last sentence of page 26 reads "Who really understands the origins of all the winding paths along which we travel?" The password from page 26 would therefore be "travel" (without quotation marks). GPS-uploadable maps are a unique feature of Trekking Peru, and we are proud of them. They remain a work in progress and we invite your comments and suggestions on how to improve them. Please contact us here. WARNING In 2017, after Trekking Peru had gone to press, muggings were reported along the trail to Aguak Cocha. Inquire with iPeru in Huaraz before hiking this route.